After falling off a building last issue, Doc lands atop a zeppelin and manages to save himself. After picking up his friends, the lot of them ensue in a zeppelin chase, going after the men who kidnapped his partners. After catching up to them, Savage manages to get himself shot in the head. In Justice Inc., Benson has gone undercover to talk to people who would not normally talk to him to find his missing employee. While his partners also search for leads, the one who seems to get the closest gets himself killed. Despite the similarities in stories, the first one pales in comparison to the second, but has been its most exciting chapter to date. Porter’s art which is good most times falls apart when it comes to facial expressions. It is not all of the time, but it is very distracting when it does happen. On the flipside, Scott Hampton’s art is subtle and forceful and is perfect for the noir style story that Jason Starr is telling. This is the third issue of the series and the third one where the second feature outshines Malmont’s lead story. 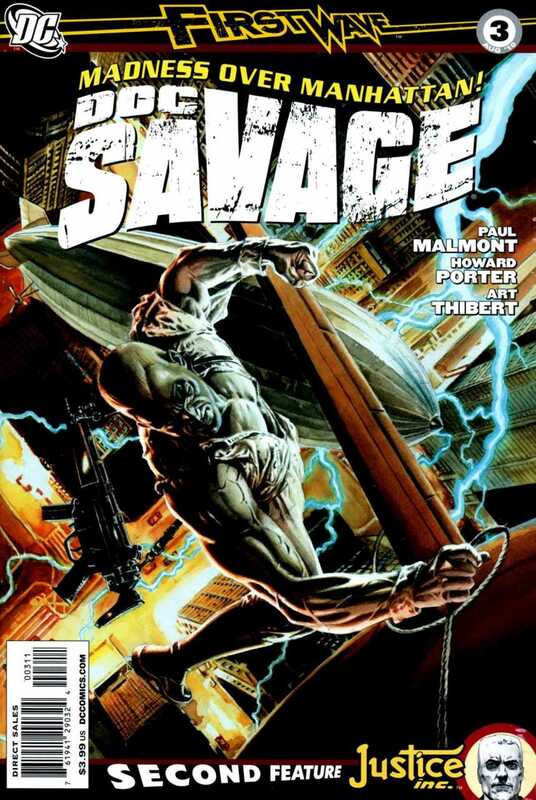 Hopefully the Doc Savage story can get turned around, if not in this arc, then hopefully the next. Why DC did not notice this strange phenomenon before publication is a little strange and why they allowed it to go through will probably never be known, but perhaps they were hoping it would get better as well.